Until someone develops an inexpensive smartphone battery that can last a week, portable batteries will be a popular accessory. The trouble is, they’re bulky and easy to lose. Enter Nifty‘s new XOO Belt, which has just launched as a crowdfunding campaign on Indiegogo. After all, you can’t lose a battery if you’re wearing it, right? Yesterday, I visited Nifty’s Manchester, UK base to give a prototype XOO Belt a try. It looks very much like a standard belt, except the buckle is a little larger than normal. That’s because of the 2,100 mAh of battery capacity available, 1,300 is inside the belt, and the remaining 800 is in the buckle. Splitting the capacity like this means that the battery need only to take up half the belt, and Nifty can offer different lengths with the same spec. It wouldn’t be fair if skinny people got less bang for their buck than their larger friends, after all. A prototype XOO belt with 3D-printed buckle. Once the XOO Belt (pronounced ‘zoo belt’) was tightened, it was time to charge my phone. A short MicroUSB lead attached to the buckle was loosely tucked against my waist on the prototype but it will be more neatly attached to the back of the belt using a magnet in the production version. 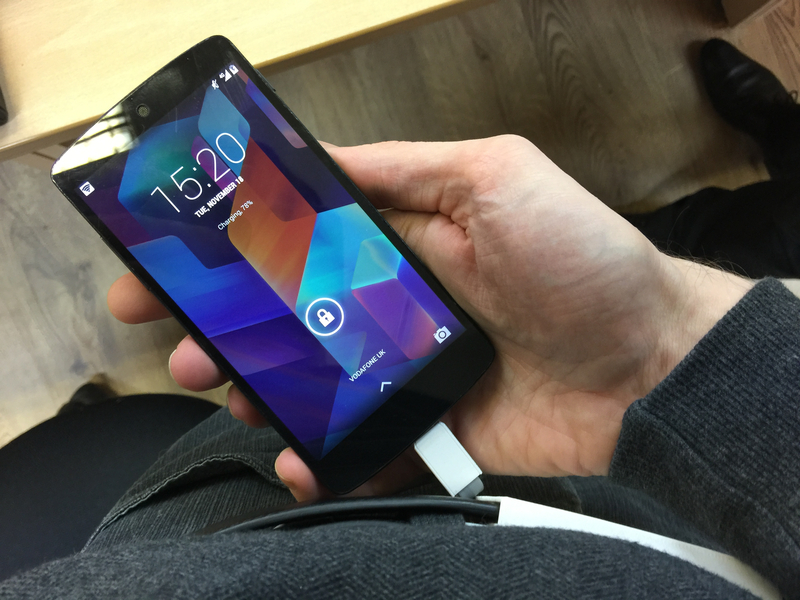 Charging my Nexus 5 was as simple as popping out the lead and attaching the phone. iPhone users will be able to use a Lightning adapter. The idea is that you’ll be able to keep your phone in your pocket, or use it without too much inconvenience, while charging. There’s enough capacity to charge many smartphones completely, and the belt takes around three hours to discharge completely. Recharging the belt is as simple as connecting it up to a computer or the mains via a MicroUSB port in the buckle. A full recharge should take three hours. The belt is separate from the buckle so that in the future, owners can easily upgrade the strap without replacing the whole device. This could be to add extra capacity or to get a whole new look. Nifty wants this to be as much about fashion as it is utility. The startup has been working with London-based design house Casely-Hayford to ensure that the finished device will look stylish, and alternative looks will be available over time. After having found success on Kickstarter with the Minidrive, Nifty is experienced with crowdfunding. Levy says the company switched to Indiegogo this time in part because the main target market is the US, and raising funds in US dollars is tricky for a UK company on Kickstarter. In less than 24 hours, Nifty has passed the half-way mark towards its target of $50,000. Securing yourself a belt will cost you $155, or you can donate $5 as an ‘armchair supporter’. Funds raised on Indiegogo will pay for tooling and production costs, and Nifty aims to ship the XOO Belt in July 2015.